My husband and I purchased our first home in May of 2007. When we moved into our new home, the walls were stark white. I appreciated the cleanliness of the white look, but wanted to add some personality and flair to the home by adding color, and decided an accent wall would be perfect for what I wanted to accomplish. Our downstairs is a large, open floor plan, with one room running into the next, and I wanted to add dimension and color to offset where the dining area in my home is. I chose red because it is not only my favorite color, but it also looks great on the accent wall against some other white items, and black and white pictures. 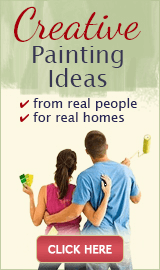 I chose the exact shade of red I wanted from a local home improvement store and got advice from a paint expert in the store on how I should best tackle my project. They suggested a tinted primer in order to get the most vibrant color I could, and several coats of paint, allowing them all to dry in between. It was also recommended that I take an entire day to tape and caulk in order to get precision lines and as little bleed through as possible. 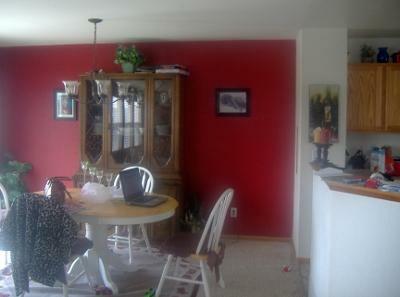 It took three days and five coats of paint, but I have my red wall, and I love it! While it was not the easiest job I have ever done, it certainly was gratifying to do it all myself. Congratulations on the great job! The only thing I want to add is that it shouldn't take 5 coats of paint to get the desired color and coverage, even if you work with red (or even darker colors). 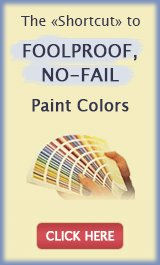 With deep colors like yours you should definitely use a primer, but not just a tinted one - it must be a GRAY primer if you want to be done in 2 coats. Another possibility may be that the paint you used was too thin (which is always the case with cheaper paints), and that's the reason you had to apply so many coats to get proper coverage. I really like the choice of red you made for your accent wall. I too have recently painted an accent wall in my dining room (by myself too I might add) and absolutely LOVE it. I think you did a great job; however, I do agree with the prior comment that it should not have taken 5 coats of paint. Mine was accomplished in 2 coats! Good luck on your next project!